It should be noted that the archaic Greek poets represented Tartaros in a very different fashion--for them it was a great cosmic pit beneath the earth in which the Titanes and hurricane-daimones were confined (see Tartaros the Pit Below the Earth). It was only in about the 5th century B.C. that Tartaros was reimagined as a type of hell and contrasted with the paradise realm of Elysion (Elysium). Ancient Greek philosophers and poets came to equate Tartaros with the dungeon of the damned in Haides and constrasted it with the Elysion fields, home of the blessed dead. When they [the souls] have arrived in presence of their judge, they of Asia before Rhadamanthys, these Rhadamanthys sets before him and surveys the soul of each, not knowing whose it is; nay, often when he has laid hold of the Great King or some other prince or potentate, he perceives the utter unhealthiness of his soul, striped all over with the scourge, and a mass of wounds, the work of perjuries and injustice; where every act has left its smirch upon his soul, where all is awry through falsehood and imposture, and nothing straight because of a nurture that knew not truth: or, as the result of an unbridled course of fastidiousness, insolence, and incontinence, he finds the soul full fraught with disproportion and ugliness. Beholding this he sends it away in dishonor straight to the place of custody, where on its arrival it is to endure the sufferings that are fitting. And it is fitting that every one under punishment rightly inflicted on him by another should either be made better and profit thereby, or serve as an example to the rest, that others seeing the sufferings he endures may in fear amend themselves. Those who are benefited by the punishment they get from gods and men are they who have committed remediable offences; but still it is through bitter throes of pain that they receive their benefit both here and in Haides (the nether world); for in no other way can there be riddance of iniquity. But of those who have done extreme wrong and, as a result of such crimes, have become incurable, of those are the examples made; no longer are they profited at all themselves, since they are incurable, but others are profited who behold them undergoing for their transgressions the greatest, sharpest, and most fearful sufferings evermore, actually hung up as examples there in the infernal dungeon, a spectacle and a lesson to such of the wrongdoers as arrive from time to time . . . And I think, moreover, that most of these examples have come from despots and kings and potentates and public administrators; for these, since they have a free hand, commit the greatest and most impious offences. Homer also testifies to this; for he has represented kings and potentates that we find the specially wicked men . . . So, as I was saying, whenever the judge Rhadamanthys has to deal with such a one, he knows nothing else of him at all, neither who he is nor of what descent, but only that he is a wicked person and on perceiving this he sends him away to Tartaros, first setting a mark on him to show whether he deems it a curable or an incurable case; and when the man arrives there he suffers what is fitting." "Sokrates (Socrates) : But now, since the soul is seen to be immortal, it cannot escape from evil or be saved in any other way than by becoming as good and wise as possible. For the soul takes with it to the other world nothing but its education and nurture, and these are said to benefit or injure the departed greatly from the very beginning of his journey thither. And so it is said that after death, the tutelary genius (daimon) of each person, to whom he had been allotted in life, leads him to a place where the dead are gathered together [i.e. the daimon guide is Plato's equivalent of Hermes Psykhopompos (Guide of the Dead)]; then they are judged and depart to the other world with the guide whose task it is to conduct thither those who come from this world [i.e. the spirit Iakkhos]; and when they have there received their due and remained through the time appointed, another guide [probably Dionysos] brings them back after many long periods of time [i.e. they are reincarnated into a new life]. And the journey is . . . neither simple nor single, for if it were, there would be no need of guides, since no one could miss the way to any place if there were only one road. But really there seem to be many forks of the road and many windings; this I infer from the rites and ceremonies practiced here on earth [i.e. the Mystery cults]. Now the orderly and wise soul follows its guide and understands its circumstances; but the soul that is desirous of the body, as I said before, flits about it, and in the visible world for a long time, and after much resistance and many sufferings is led away with violence and with difficulty by its appointed genius (daimon). And when it arrives at the place where the other souls are, the soul which is impure and has done wrong, by committing wicked murders or other deeds akin to those and the works of kindred souls, is avoided and shunned by all, and no one is willing to be its companion or its guide, but it wanders about alone in utter bewilderment, during certain fixed times, after which it is carried by necessity to its fitting habitation [i.e. by the Erinyes to Tartaros]. But the soul that has passed through life in purity and righteousness, finds gods for companions and guides, and goes to dwell in its proper dwelling [i.e. the Elysian fields]." Sokrates (Socrates) : Round about the whole earth, in the hollows of it, are many regions, some deeper and wider than that in which we live, some deeper but with a narrower opening than ours, and some also less in depth and wider. Now all these are connected with one another by many subterranean channels, some larger and some smaller, which are bored in all of them, and there are passages through which much water flows from one to another as into mixing bowls; and there are everlasting rivers of huge size under the earth, flowing with hot and cold water; and there is much fire, and great rivers of fire, and many streams of mud, some thinner and some thicker, like the rivers of mud that flow before the lava in Sikelia (Sicily), and the lava itself. These fill the various regions as they happen to flow to one or another at any time. Now a kind of oscillation within the earth moves all these up and down. And the nature of the oscillation is as follows. One of the chasms of the earth is greater than the rest, and is bored right through the whole earth; this is the one which Homer means when he says : ‘Far off, the lowest abyss beneath the earth’; and which elsewhere he and many other poets have called Tartaros. For all the rivers flow together into this chasm and flow out of it again, and they have each the nature of the earth through which they flow. And the reason why all the streams flow in and out here is that this liquid matter has no bottom or foundation. So it oscillates and waves up and down, and the air and wind about it do the same; for they follow the liquid both when it moves toward the other side of the earth and when it moves toward this side, and just as the breath of those who breathe blows in and out, so the wind there oscillates with the liquid and causes terrible and irresistible blasts as it rushes in and out. And when the water retires to the region which we call the lower, it flows into the rivers there and fills them up, as if it were pumped into them; and when it leaves that region and comes back to this side, it fills the rivers here; and when the streams are filled they flow through the passages and through the earth and come to the various places to which their different paths lead, where they make seas and marshes, and rivers and springs. Thence they go down again under the earth, some passing around many great regions and others around fewer and smaller places, and flow again into Tartaros, some much below the point where they were sucked out, and some only a little; but all flow in below their exit. Some flow in on the side from which they flowed out, others on the opposite side; and some pass completely around in a circle, coiling about the earth once or several times, like serpents, then descend to the lowest possible depth and fall again into the chasm. Now it is possible to go down from each side to the center, but not beyond, for there the slope rises forward in front of the streams from either side of the earth. Now these streams are many and great and of all sorts, but among the many are four streams, the greatest and outermost of which is that called Okeanos (Oceanus), which flows round in a circle, and opposite this, flowing in the opposite direction, is Akheron, which flows through various desert places and, passing under the earth, comes to the Akherousian (Acherusian) Lake. To this lake the souls of most of the dead go and, after remaining there the appointed time, which is for some longer and for others shorter, are sent back to be born again into living beings. The third river flows out between these two, and near the place whence it issues it falls into a vast region burning with a great fire and makes a lake larger than our Mediterranean sea, boiling with water and mud. Thence it flows in a circle, turbid and muddy, and comes in its winding course, among other places, to the edge of the Akherousian Lake, but does not mingle with its water. Then, after winding about many times underground, it flows into Tartaros at a lower level. This is the river which is called Pyriphlegethon, and the streams of lava which spout up at various places on earth are offshoots from it. Opposite this the fourth river issues, it is said, first into a wild and awful place, which is all of a dark blue color, like lapis lazuli. This is called the Stygios (Stygian River), and the lake which it forms by flowing in is the Styx. And when the river has flowed in here and has received fearful powers into its waters, it passes under the earth and, circling round in the direction opposed to that of Pyriphlegethon, it meets it coming from the other way in the Akherousian Lake. And the water of this river also mingles with no other water, but this also passes round in a circle and falls into Tartaros opposite Pyriphlegethon. And the name of this river, as the Poets say, is Kokytos (Cocytus). Such is the nature of these things. Now when the dead have come to the place where each is led by his genius (daimon) [i.e. Plato's equivalent of Hermes Psykhopompos (Guide of the Dead)], first they are judged and sentenced [i.e. by the Judges of the Dead], as they have lived well and piously, or not. And those who are found to have lived neither well nor ill, go to the Akheron and, embarking upon vessels provided for them [i.e. the equivalent of Kharon's skiff], arrive in them at the lake; there they dwell and are purified [i.e. by the equivalent of the Erinyes], and if they have done any wrong they are absolved by paying the penalty for their wrong doings, and for their good deeds they receive rewards [i.e. in Elysion (Elysium)], each according to his merits. But those who appear to be incurable, on account of the greatness of their wrongdoings, because they have committed many great deeds of sacrilege, or wicked and abominable murders, or any other such crimes, are cast by their fitting destiny into Tartaros, whence they never emerge. Those, however, who are curable, but are found to have committed great sin--who have, for example, in a moment of passion done some act of violence against father or mother and have lived in repentance the rest of their lives, or who have slain some other person under similar conditions--these must needs be thrown into Tartaros, and when they have been there a year the wave casts them out, the homicides by way of Kokytos (Cocytus), those who have outraged their parents by way of Pyriphlegethon. And when they have been brought by the current to the Akherousian Lake, they shout and cry out, calling to those whom they have slain or outraged, begging and beseeching them to be gracious and to let them come out into the lake; and if they prevail they come out and cease from their ills, but if not, they are borne away again to Tartaros and thence back into the rivers, and this goes on until they prevail upon those whom they have wronged; for this is the penalty imposed upon them by the judges." 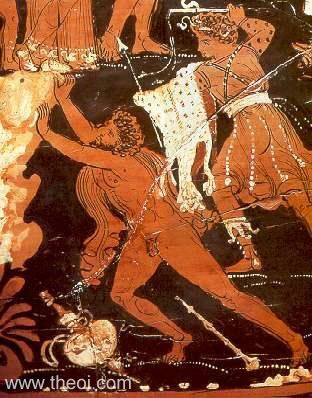 "[Aiakos (Aeacus), the gatesman of Haides, threatens the god Dionysos with imprisonment in the dungeons of Hell :] ‘The black hearted Stygian rock and the crag of Akheron (Acheron) dripping with gore can hold you; and the circling hounds of Kokytos (Cocytus) and the hundred-headed serpent (ekhidna) [probably Typhoeus] shall tear your entrails; your lungs will be attacked by the the Tartesian Eel (Myraina Tartesia) [probably Ekhidna], your kidneys bleeding with your very entrails the Teithrasian Gorgones will rip apart.’"
"[The ghost of Anchises appears to his son Aeneas in a dream :] ‘Approach the nether halls of Dis [Haides], and through the depths of Avernus seek, my son, a meeting with me. For impious Tartarus, with its gloomy shades, holds me not, but I dwell in Elysium amid the sweet assemblies of the blest.’"
"[The Sibyl guides Aeneas through the underworld :] ‘Here is the place, where the road parts : there to the right, as it runs under the walls of great Dis [Haides], is our way to Elysium, but the left wreaks the punishment of the wicked, and send them on to pitiless Tartarus.’ . . .
Then the seer thus began to speak : ‘Famed chieftain of the Teucrians, no pure soul may tread the accursed threshold; but when Hecate set me over the groves of Avernus, she taught me the gods' penalties and guided me through all. Cretan Rhadamanthus holds here his iron sway; he chastises, and hears the tale of guilt, exacting confession of crimes, whenever in the world above any man, rejoicing in vain deceit, has put off atonement for sin until death's late hour. Straightway avenging Tisiphone, girt with the lash, leaps on the guilty to scourge them, and with left hand brandishing her grim snakes, calls on her savage sister band. Then at last, grating on harsh, jarring hinge, the infernal gates open. Do you see what sentry [Tisiphone] sits in the doorway? what shape guards the threshold? The monstrous Hydra, still fiercer, with her fifty black gaping throats, dwells within. Then Tartarus itself yawns sheer down, stretching into the gloom twice as far as is the upward view of the sky toward heavenly Olympus. Here the ancient sons of Earth, the Titan's brood, hurled down by the thunderbolt, writhe in lowest abyss. Here, too I saw the twin sons of Aloeus, giant in stature, whose hands tried to tear down high Heaven and thrust down Jove [Zeus] from his realm above. Salmoneus, too, I saw, who paid cruel penalty while aping Jove's fires and the thunders of Olympus. Borne by four horses and brandishing a torch, he rode triumphant through the Greek peoples and his city in the heart of Elis, claiming as his own the homage of deity. Madman, to mimic the storm clouds and inimitable thunder with brass and the tramp of horn-footed horses! But the Father Almighty amid thick clouds launched his bolt--no firebrands he, nor pitch-pines' smoky glare--and drove him headlong with furious whirlwind. Likewise one might see Tityos, nursling of Earth the mother of all. Over nine full acres his body is stretched, and a monstrous vulture with crooked beak gnaws at his deathless liver and vitals fruitful of anguish; deep within the breast he lodges and gropes for his feast; nor is any respite given to the filaments that grow anew. Why tell of the Lapiths, Ixion and Pirithoüs, and of him [Tantalus] over whom hangs a black crag that seems ready to slip and fall at any moment? High festal couches gleam with backs of gold, and before their eyes is spread a banquet in royal splendour. Reclining hard by, the eldest Fury stays their hands from touch of the table, springing forth with uplifted torch and thunderous cries. ‘Here were they who in lifetime hated their brethren, or smote a sire, and entangled a client in wrong; or who brooded in solitude over wealth they had won, nor set aside a portion for their kin--the largest number this; who were slain for adultery; or who followed the standard of treason, and feared not to break allegiance with their lords--all these, immured, await their doom. Seek not to learn that doom, or what form of crime, or fate, overwhelmed them! Some roll a huge stone, or hang outstretched on spokes of wheels; hapless Theseus sits and evermore shall sit, and Phlegyas, most unblest, gives warning to all and with loud voice bears witness amid the gloom : "Be warned; learn ye to be just and not to slight the gods!" This one sold his country for gold, and fastened on her a tyrant lord; he made and unmade laws for a bribe. This forced his daughter's bed and a marriage forbidden. All dared a monstrous sin, and what they dared attained. Nay, had I a hundred tongues, a hundred mouths, and voice of iron, I could not sum up all the forms of crime, or rehearse all the tale of torments.’"
"[Apollon threatens to cast the infant god Hermes into Tartaros for stealing his cattle :] ‘For I will take and cast you into dusky Tartaros and awful hopeless darkness (zophon), and neither your mother nor your father shall free you or bring you up again to the light, but you will wander under the earth and be the leader amongst little folk [i.e. of the ghosts of children in Haides].’"
"I often weep in fear of Tartaros : for the recess of Haides is grim, and the road down to it grievous; and it is certain that he who goes down does not come up again." "Tartessos [a river near Gadeira in Southern Iberia] was known by hearsay as ‘fathermost in the west,’ where, as the poet [Homer] himself says, falls into Okeanos (Oceanus) ‘the sun's bright light drawing black night over earth, the grain-giver.’ Now, that night is a thing of evil omen and associated with Haides, is obvious; also that Haides is associated with Tartaros. Accordingly, one might reasonably suppose that Homeros, because he heard about Tartessos, named the farthermost of the nether-regions Tartaros after Tartessis, with a slight alteration of letters; and that he also added a mythical element, thus conserving the creative quality of poetry." There are numerous other references. The association between Haides and Tartaros is common amongst the Latin poets.